Sterilising jars/bottles is essential to prevent the build up of bacteria to ensure long life of your preserves and prevent you getting ill. I have done some background research on the web and three ways consistently come up for how to sterilise jars. However I bought some very cute Weck Jars at the weekend (see my Banoffee pots recipe) and they came with a set of instructions for cleaning. The method they recommend is the oven approach. They do not recommend using a dishwasher as the temperature needs to get to 100 degrees and most of them don’t get that hot. 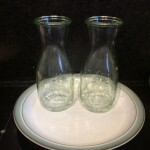 Therefore are 2 easy ways to sterilise jars, oven or microwave method as they are quick. When making Jams and other preserves put the warm preserves into warm jars to reduce the risk of the glass shattering. Try and time your sterilisation technique to be ready at the same time as the preserve. You can reuse jars, check that they aren’t chipped or cracked. Look for ones with plastic covered metal tops as these won’t go rusty or react the the contents. Soak them in washing up water to remove any of the original labels. Wash them and throughly rinse with cold water and leave them to drain. What sterilisation method should you use? For jam jars with lids use the oven method as this works for the jars and lids. I would also tend to use this approach for anything I am planning to keep for a long time. Just make sure your oven is clean before doing this. 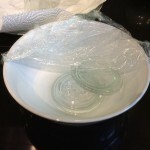 For glass jars you are planning to top with plastic jam covers the microwave method is the quickest. Do not microwave any metal tops or kilner metal parts. For Kilner jars the oven method can be used for the glass and metal, but don’t use it for the rubber seals. 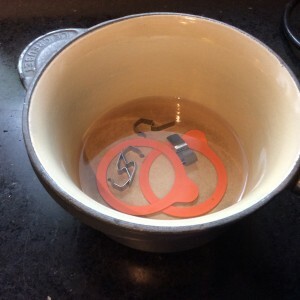 The rubber seals can be soaked in almost boiling water for ten minutes. 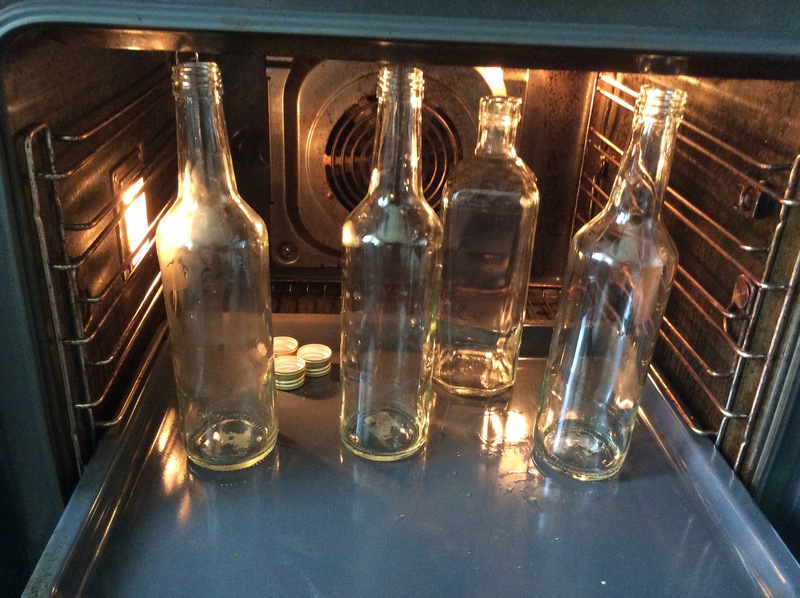 Place jars or bottles and lids on a baking sheet, ensure that they do not touch. Put into a cold oven and set the temperature for 120 degrees Centigrade fan. Cook for 20 minutes or until completely dry. Fill each jar/bottle with 3 tablespoons of water, without their tops. 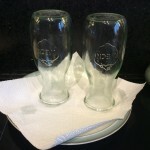 For glass tops for bottles these can be microwaved in a cling film covered bowl with 3 tablespoons of water. Microwave on full power for 2 minutes. Wear oven gloves when removing them from microwave as they will be very hot. Leave to drain on kitchen paper. Leave preserve to cool for 10 to 15 minutes and then spoon into warm jars. A funnel makes this easier to do, make sure it is very clean, I soak mine in boiling water. Top jams with a disc of greaseproof or baking paper. I cut mine to size by using the lid as a guide and making it a little bit smaller. Dip paper in boiling water before topping the jam. Cover the jars and then leave cool. With Kilner jars or the Weck Jars once cool the rubber ring should firmly hold the top of the Jar in place. The instructions for the Weck states if you remove the clips and the top isn’t firmly in place the preserving process hasn’t worked. The cooling of the hot air in the jar should make a vacuum. If this isn’t the case if you’ve just made the preserve it will be safe to eat otherwise you shouldn’t eat it. Jams and chutneys can be stored in a cool dark place. Sauces and curds need to be kept in the fridge.